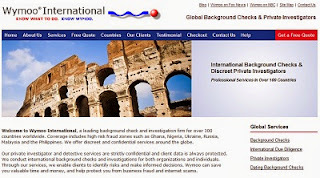 Global investigation coverage and scam prevention from experienced private detectives. Why all the Buzz About Wymoo? If you haven't heard the name yet, and you're familiar with the background check industry, you will. No other player is making waves in the international investigation market like Wymoo®. In less than two years the firm has emerged from a limited website operation to a full scale global player, putting pressure on well-placed corporations to rethink their strategy. What's behind the phenomenol growth and rapidly increasing market share? Our report covered several factors comparing Wymoo International to its competitors, but one area clearly stood out as their secret. Simply put: client service. While many websites and companies have focused on obtaining data via increasing automation and technology, Wymoo seems to have done the opposite. For example, when a client uses Wymoo's international investigative services, he or she is assigned an investigator to personally handle that client's case until and after completion. Reports are then emailed to clients 5 to 7 days later, in narrative reporting with personal attention, that well, we haven't seen in years. And, it hasn't gone unnoticed. Estimates of market share are hard to determine, as Wymoo is a privately held company and closely guards all of its proprietary information. We do know, however, that it has increased more than 500% in 2006, with inception just in early 2005. In an interview with the firm's Vice President, David Wilkerson, our industry expert Danny Olson asked Wilkerson if this growth could continue, and whether or not he could shed any light on Wymoo's growth strategy. "We've built our firm on providing confidential and personalized professional investigations. Our global focus is strongly on client service and narrative reporting, not generic database search and automated reports. More companies today are geared towards outsourcing and automation. We prefer to do things the old-fashioned way, and there's no replacement for professional field investigators and real investigation." Private investigators agree. Many developing countries don't have computerized public records, and the only way to obtain evidence in many international cases is to have an investigator on the ground. Local field investigators speak the same language and have contacts in the area, and can obtain records from local offices and courts. Having a local investigator means real investigation can be done, i.e. interviews and surveillance. Wymoo has field investigators in over 100 countries. Client satisfaction is reportedly the highest in the industry at Wymoo, and it's no wonder that the firm has rapidly become a global competitor. As growth continues, keeping the personalized service and fending off competitors will be a real challenge. Asked about this concern, Wilkerson replied "our goal is to be the best, not the biggest. If we ever start to lose quality, we'll put the brakes on." So far the company's stategy is clearly working. We'll follow up on the investigative firm in 2008. This copyrighted article was written and published by the editor and site author, A. Hathaway, or other guest private investigator, expert or contributor as noted. This is good news and well done. Half of the sites offering "background checks" search a database and then give you a report that isn't worth a dime. There is still a lot of confusion about real private investigators who do real background check investigations versus a website that just checks criminal records (which can't even be done anyway outside the US). People need to understand that checking criminal records is not a background check, and anyone claiming so is negligent or has no expertise in risk management or private investigation, period. Glad to hear this company is doing well because they seem to get it. Verifying a person or company requires real investigators. A. Hathaway has 20 years of experience in global fraud prevention, international investigation and background checks for corporate and individual clients. He serves as a consultant for investigation firms in the Americas, Europe and Asia, and has been a senior investigator for cases in over 30 countries. He is considered an expert in risk mitigation and global due diligence.